This past week I was on my annual Spring Training trip down South. This year I was joined by my best friend John Porzio. We flew into Atlanta, surprised my 2 nephews, had dinner with them, my brother and his wife then started our drive back home. First stop was Tanglewood in North Carolina(home of the 1974 PGA championship). Upon arriving there, we were greeted with about an inch of snow that delayed opening until 12pm. On the fly we decided to skip Tanglewood as we were on a tight schedule the next couple of days. Next stop was Primland resort in Meadows of Dan Virginia. This resort is ranked #21 in golf digest public course list and is now home to a Tavistock Cup team and consists of a lodge and a very large hunting ground. After driving on a country road for about 20 mins you arrive at a gate and must buzz in. Once through the gate you have a 8 mile drive up the mountain on a very windy road that takes about 30 minutes; its worth it. 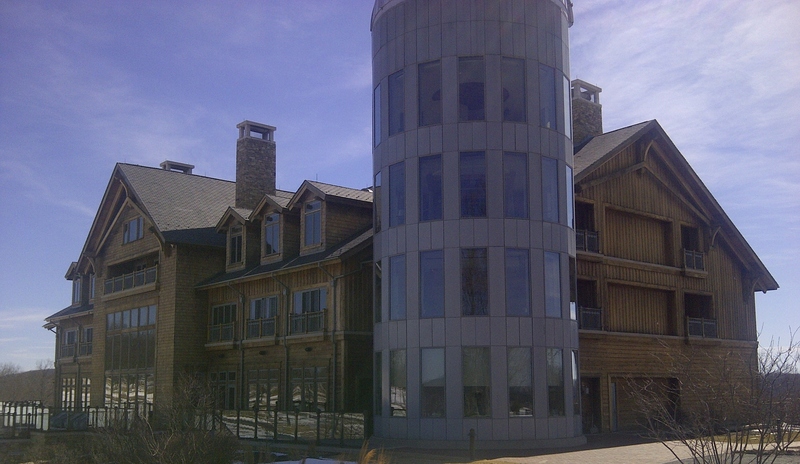 The lodge,pic below, is stunning and has neverending views of the Blue Ridge Mountains. Next stop was the Pete Dye River Course at Virginia Tech. This course runs along side of the New River, which is the oldest river in the country and the second oldest river in the world behind the Nile. Don’t ask me how they age rivers but I guess they do. The river is wide and runs fast, and I am sure is home to tons of wildlife in the Summer. We saw a mink on the course; first time I ever seen one of those. As far as the course goes, the holes feel repetitive and the greens are as small and tough as they come. Its a flat links style course and is one of the best college courses in the country. The final stop on this short trip was Spring Creek in Gordonsville VA. Spring Creek is #58 on golf digest’s list and is deserving of that. They are in the middle of finishing a beautiful club house that will make this a top class country club. The pro there, Kevin Haney, no relation to Hank, was very accommodating and the members there are lucky to have him. The never flat fairways here make this course very tough . Overall the trip was great but too short. I am thinking about doing another one this year; maybe Williamsburg or Ocean City. Stay tuned.